Hyundai Motor America touts its NFL deal with logos over a football field background on the side of its Fountain Valley, Calif., headquarters. Hyundai and its corporate-owned ad agency, Innocean, made big changes in June amid Hyundai's campaign for a louder voice in U.S. media. Who's in Steve Jun, CEO, Innocean USA. After an 18-month stint leading Innocean's European division, he was brought to Huntington Beach, Calif., to run the shop. Tim Blett, managing director, Innocean USA. He once managed the “Zoom Zoom” campaign for Mazda at ad agency Doner; now he's on Innocean's Hyundai account. Who's out Tony Kim, CEO, Innocean USA. After six years leading the agency's U.S. office, Kim was given a new posting at Innocean's headquarters in Seoul. David Matathia, director of marketing communications, Hyundai Motor America. He left for a high-ranking job at an Atlanta advertising agency, leaving Hyundai Motor America without a chief marketing officer or a No. 2 marketer. 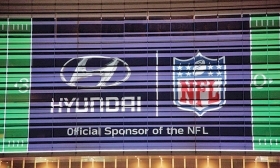 Hyundai Motor Co.'s sponsorship of the National Football League is just the latest sign of the Korean group's affinity for sports marketing. Here are 3 other deals in place. FIFA: Since inking a deal with the global soccer federation in 1999, Hyundai has sponsored 4 World Cups. Its current deal, which includes Kia, runs through 2022. NBA: Kia has sponsored the National Basketball Association since 2009, when it replaced Toyota. Throughout the season, stars vie to be the Kia Player of the Month. NCAA: Hyundai has held campus events at hundreds of college football games since 2011 with marketing firm IMG, often wrapping cars in the colors of the home team. Zuchowski: "We are huge football fans." On any given Sunday this fall, Hyundai Motor Co. will enjoy the national spotlight alongside stars such as Tom Brady and Russell Wilson. Yet it's still unclear whether Hyundai will be ready to make the most of the opportunity. Last week, the Korean automaker announced a four-year sponsorship of the National Football League, whose popularity is so overwhelming that all 20 of the most-watched U.S. TV programs last fall were NFL games, according to the rating service Nielsen. Wresting the deal from General Motors, which had used football broadcasts to promote its GMC truck brand, was seen as a way for Hyundai to elevate its stature in the U.S.
"We are huge football fans at Hyundai and feel there is no better venue to reach consumers, increase consideration and tell the Hyundai brand story," Hyundai Motor America CEO Dave Zuchowski said in a statement. But like a football team without a quarterback, Hyundai, which has lost both of the top executives in its marketing department, has a stiff challenge ahead. Hyundai parted ways with marketing chief Steve Shannon in November. No replacement has been named. One possible candidate, Shannon's second-in-command David Matathia, left Hyundai last week for a job at an ad agency in Atlanta. Meanwhile, Hyundai's corporate-owned advertising agency, Innocean, replaced its U.S. leadership in what sources described as an attempt to improve ties with Hyundai. Steve Jun, CEO of Innocean's European division, was tapped to lead the office, replacing Tony Kim, who was reassigned to Innocean's headquarters in Seoul. Hyundai has refrained from publicly criticizing Innocean's work. Yet the company's dealers have been unhappy with the quality of Hyundai's national advertising, says Adam Kraushaar, president of Lester Glenn Auto Group in Toms River, N.J., and chairman of the Hyundai National Dealer Council. "Whether this was a shake-up or just the normal rotation that Korea likes to do," he said of the CEO swap, "some new blood at Innocean can only be a good thing." GM had sponsored the NFL since 2001. Its sponsorship nominally cost about $25 million per year, but the company was estimated to have spent more than $150 million per year on NFL-related marketing, including TV advertisements. "We value our relationship with the NFL and its fans, but have decided to focus our sponsorship resources in other areas in the future," the company said in a statement. Hyundai's sponsorship will give the company preferred access to events such as the NFL Draft and Super Bowl. But according to a report last week by ESPN.com, the NFL will still be allowed to sign separate sponsorship deals for the official truck of the NFL and for the Super Bowl's most valuable player award.